SHREWSBURY, Mass. 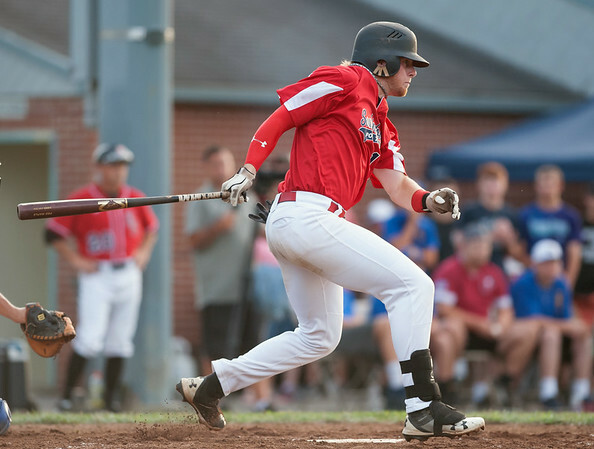 - Six Southington pitchers combined to allow 10 earned runs on 14 walks and eight hits with just two strikeouts over six innings as Post 72 was eliminated from the American Legion Northeast Regional Tournament on Saturday evening with a 10-3 loss to Braintree, Mass. Southington also had eight hits in the game, but the Braintree pitchers limited Post 72 to two walks and three earned runs, while collecting eight strikeouts. Southington took the early lead in the top of the first inning, as Daniel Topper hit a leadoff single, stole second, went to third on a ground out and scored on a double from Brayden Cooney. That lead didn’t last long, though, as Braintree put together a three-run rally with one out on back-to-back walks, back-to-back singles, a sacrifice fly and another RBI single. Braintree added another pair of runs in the second for a 5-1 lead before Southington scored a pair in the top of the third on a Brandon Kohl leadoff single, a passed ball, a walk to Josh Panarella, a wild pitch and an RBI double from Cooney. Braintree took control of the game with a three-run rally in the fourth inning for an 8-3 lead. The rally was fueled by four walks - one of which was intentional, two of which drove in runs - a double and a two-out RBI single. The Massachusetts team added single runs in the fifth and sixth innings. Cooney paced Southington’s offense, going 3-for-4 with two doubles and two RBI. Kohl and Jake Romano each went 2-for-3 in the game. Posted in New Britain Herald, Southington on Saturday, 11 August 2018 23:06. Updated: Saturday, 11 August 2018 23:08.